They melted my heart LOL. 81 days in rescue is a long time. They've got a great home now with someone who loves them and will give them the best care. I'm wondering if I should try to get Scruffy to become cage mates with Sam and Dean. I think Mr Bubbles is out of the question because he's more aggressive. Scruffy is 2 years old while Sam and Dean are 9 months. Size wise, all 3 are about the same size. I expect that Sam and Dean will get bigger. Scruffy is pretty much done increasing in size. Other things to consider is that while he's fully recovered from the infection that nearly killed him, Scruffy might not be back to full strength yet. The other two might see him as an intruder and might gang up on him. Scruffy is very resilient and doesn't back down. Among the other two, I'm relatively sure that Dean is the more dominant one. Sammy always moves out of his way whenever Dean wants the tunnel for himself or when he wants the veggies or the water. Dean also outweighs Sammy by a few ounces. What do you guys think? Should I try it? If so, what experiences have you had? What works and what doesn't? I have never had boars but I think you will find some members who advise against having three together. I'll let others comment. I thought that post was lost, so I put it in Sam and Dean's thread. Sorry about the repeat! Suffice it to say that I'm not going to poke the bear (or in this case the boar) and put the bond between them at risk. Scruffy says "give me what I want or I'll eat the shirt!" His weight is holding steady at about 1 lb 15 oz. He's even gained half an ounce. 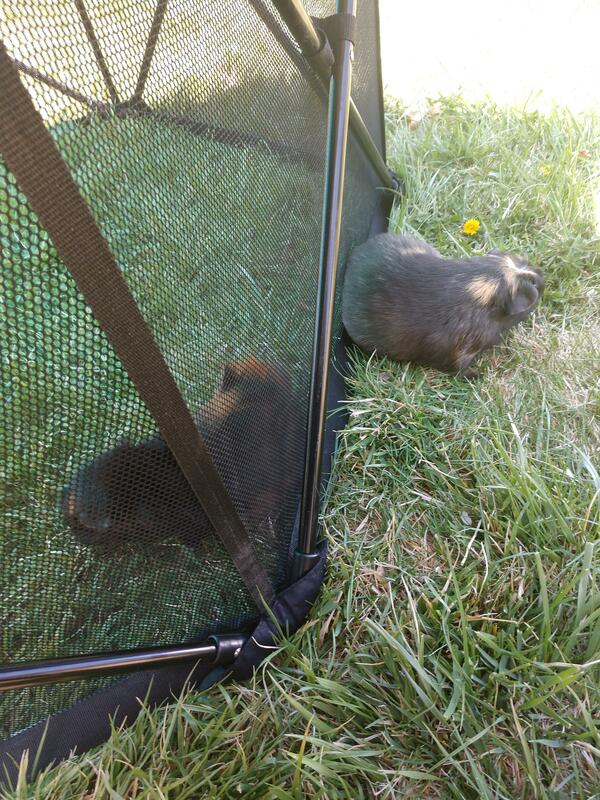 Introduced the newbies, Sam and Dean to the outside grass eating experience today and it didn't go too bad. They were a little bit jumpy, but nowhere near as calm as these two. These two took to it immediately 2 years ago when I introduced them to it and they're old pros now. They hardly bat an eye unless it's a really loud noise. They eat their fill and let me know when they're done. They get pouty if I have to take them inside for any reason before that. I have their total trust, so they feel very secure with me watching over them when they go outside. I hope to gain that kind of trust with the other two. Looks like some lovely, hearty grass! p.s. I think gaining an animal's trust is the highest honor. The grass is coming in very nicely. Lucky for them LOL! After sitting with Sam and Dean, watching them act a little skittish, I felt proud watching Mr Bubbles and Scruffy so relaxed. I live by the airport, so there's planes but they don't even flinch when one takes off. They aren't scared of any of the neighborhood noises. With me watching over them, they have nothing to fear. It's been too chilly for the boys to go out for grass the last 2 days. They're getting a little stir crazy because they had been outside for several days in a row before that. I have to go pick grass for them. I feel bad when they give me that look and those sad little squeaks LOL. There's a storm over the mountains, which means cold, wind and rain for the next 2-3 days. I'm glad I haven't gotten around to mowing the lawn yet! Read so literature online today and found out that dandelion is a good source of vitamin C and can be given several times a week. I was really glad to hear that because my lawn is full of them. So is the flower beds and gardens. The ones on the lawn compete with the grass for nutrients, but the flower bed and garden dandelions don't. Since I haven't tilled them yet, they're huge with giant leaves. Both Scruffy and Mr Bubbles both devoured 3 or 4 of them. That with the quarter bell pepper should take care of their vitamin c needs for the day. Dandelion is also high in calcium, if I remember right. So if you have any guinea pigs prone to stones, you would limit it. Correct. Several times a week to me means that I give it to them every other day. Also I took it as not allowing them to eat their fill like with hay and grass. A few leaves should suffice. 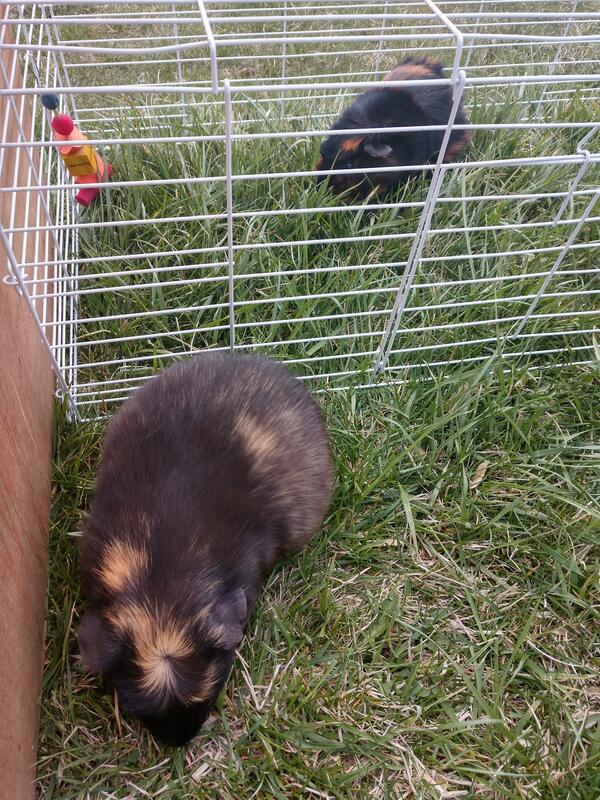 My professional grass eaters. I found a new use for the playpen that the baby outgrew. Yesterday was far too hot for the boys to go outside and by the time it cooled down enough, I was out running errands. So they missed their grazing time. I made it up to them this evening. They got their fill and didn't complain when I took them inside. They both laid down and took a nap. They rested for about an hour and woke up recharged and ready to go. The arrival of the two new piggies is having a positive effect on them. Mr Bubbles is more active in his cage than he was before. He has started that nibbling on his cage when he wants something like Scruffy does. He squeaks more too. He's always had that "too cool to be a guinea pig" thing going on so he's never been very vocal. That has all changed now. Scruffy has started wheeking very loudly because he hears Sammy doing it. He wants to be held all of the time too. Even though neither one of them share an enclosure (only Dean and Sammy do), I've got a very nice guinea pig colony going on . Sammy and Dean are across the room from these guys, but they are aware of each other's presence; in a positive way, it would seem. And a happy colony at that! 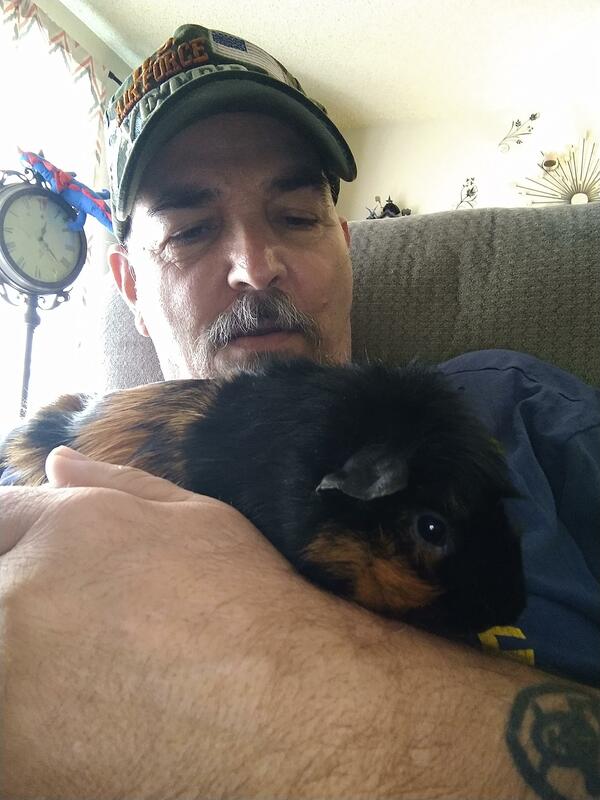 Glad to hear your other guinea pigs are perking up too.